There is an old saying that “Imitation is the sincerest form of flattery.” Even if this statement is only partially true, then the Fostoria Glass Company (and the workers and craftsmen thereof) should have been extremely proud of their accomplishment with the American pattern. Never have I seen a particular pattern of glass so heavily imitated. After all, imitators like to copy things that consist of greatness. The following is a list of popular glass patterns that are very similar to the Fostoria American line. Some of these patterns were produced right here in the United States, while others were produced as far away as the United Kingdom. Georgian Pattern – National Glass Company, Ltd. The Georgian pattern was formed in the early years of the 20th century, and included several different types of items, such as Tableware, Toilet, or Trinkets. Some of the more popular items were the Hair Receiver Box, Washbowl and Pitcher, Regular Ice Tea, Soap Box, a Candlestick, etc. We now know that the Fostoria Glass Company did have representatives in England that sold their glassware to other sources. Even in Fostoria’s initial letter of the 1915 Catalog Supplement introducing the American line, they state “We predict it will be a ‘repeater’, not only in the United States but in foreign countries; in fact, foreign dealers have already cabled us for additional samples, and thus give it the stamp of their approval.” Therefore, without a doubt, we know that American items were being imported into foreign countries. A popular theory regarding the Georgian pattern name is that the items being imported into Europe needed to have a more British name – other than “American”. The Georgian pattern was then born. As of now, I have not uncovered any evidence or documentation on whether pieces from other glass companies were also used in the Georgian pattern. Some items portrayed in the Georgian advertisements, such as the Washbowl and Pitcher, are still a mystery. Documentation on these pieces (or the lack of it), keeps their provenance at bay. Some published sources state that the Washbowl and Pitcher were pressed in England, from imported Fostoria moulds. 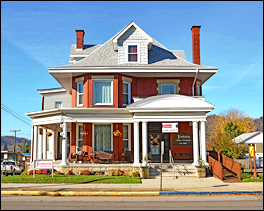 Other resources state that there is no evidence that the Fostoria Glass Company exported any of their moulds out of the United States. Therefore, I refrain from making any determination until all the evidence is in. Further documentation is still needed, void of any assumptions or probabilities. The beautiful cube glass pattern from Liebochwitzer Glasshütte Company of Czechoslovakia is remarkably similar to the American 2056 line. Czech Cube Glass was being produced circa 1925-1928, and its existence has only been brought to our attention in recent years. We are now aware that this cubed-style glassware was made overseas and sold in England. As of today, catalog documentation provides definitive proof that the Czech Cube Glass pieces are of European origin. Czech Cube Glass was not produced by the Fostoria Glass Company. 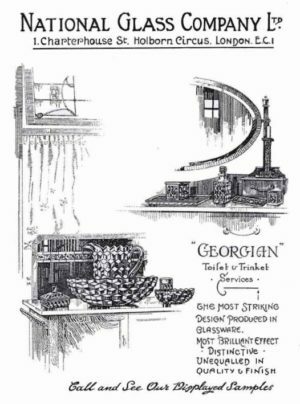 2077 Suite – James A. Jobling and Co. Ltd.
Another English company that manufactured a line of glassware with a cube form was the James A. Jobling & Co. Ltd. This company’s 2077 Suite of products utilizes the cube form; however, it contains an elongated starburst as part of its design. 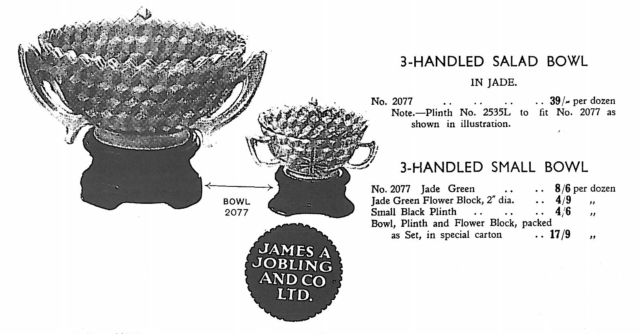 Jobling produced the 2077 Suite pattern in the early 1900’s; however, it was not until the mid-1930’s that the Jade Green pieces were introduced. Primarily, the 3-Handled Salad Bowls and Small Bowls were made in the Jade Green color. Earlier versions, in limited quantities, can be seen in clear flint glass and a rare turquoise color. It is important to note that there are published sources that list these items as being “rare” Fostoria American pieces. In truth, these items look similar to the American pattern; however, they are not part of the Fostoria American Line 2056. These items were produced in the 2077 Suite pattern, by James A. Jobling and Co. Ltd. Their origin is European, and they were not offered or produced by the Fostoria Glass Company. The Jade Green bowls were only made for a few years, as the depression and WWII put an end to production. When one considers all of the glass factories that were in existence in the 1920’s, then Jeannette Glass Company has to be considered one of the great pioneers in the industry. It was an impressive contributor to the depression era, bringing color and glass automation practices to the forefront. The same person that designed the American pattern (Mr. Phillip Ebeling) also designed the Cubist pattern by Jeannette Glass. Because of patent laws, there had to be differences between the two patterns. Cubist was machine-made, with flatter cubes, and void of expensive finishing touches. The American pattern was just the opposite, so one should not compare the two. The Cubist pattern mainly produced items in clear crystal, pink, and green. Other rarer colors have also been seen. The Cubist Pattern did not have a long life, and was only in production from approximately 1929-1933. 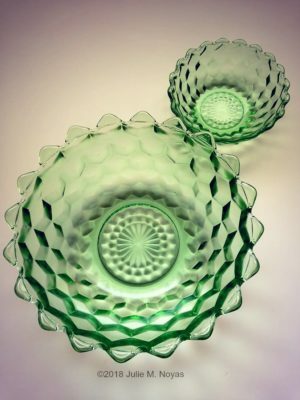 It is often referred to as “Depression Glass”, and is still quite collectible today. If you are interested in learning more about current availability and pricing of the Jeannette Glass pieces, please click the following sponsored link for available Cubist items on eBay. The Whitehall and/or American Whitehall pieces were not produced by the Fostoria Glass Company. The different Whitehall patterns seem to be a topic of much confusion, and it is easy to understand why. 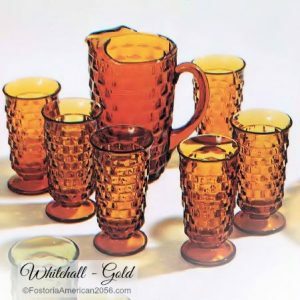 The Whitehall pattern was produced first; originally produced by the Colony Glass Company. 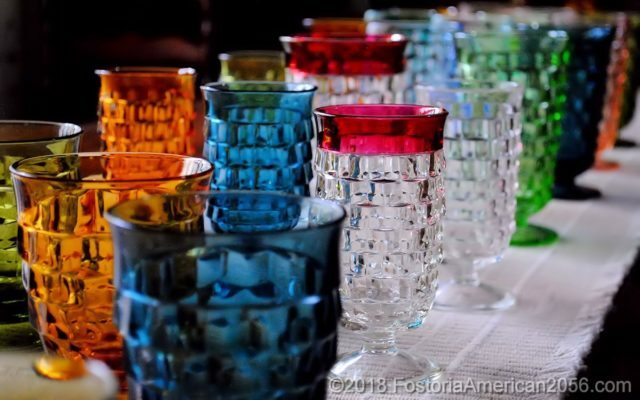 Years later, when Lancaster Colony (parent company) purchased Fostoria Glass, a significant number of original Fostoria moulds were merged into the original Whitehall pattern. It was at this time that the Whitehall line was changed to American Whitehall. The Whitehall and/or American Whitehall patterns produced many lovely pieces in a variety of colors. Their items not only came in Crystal, but were also produced in Olive, Gold, Riviera Blue, Ruby, Evergreen, Blue, Teal, Cobalt, Peach, etc. The Whitehall lines are a wonderful collection of dishes to use every day, and are very durable. When you don’t want to risk breaking a beloved piece of genuine Fostoria, these vintage Look-Alikes will come in very handy. If you are interested in learning more about current availability and pricing of Whitehall and/or American Whitehall pieces, please click the following sponsored link for available items on eBay. 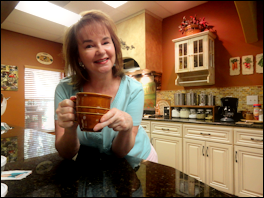 American Lady Love – Home Interiors & Gifts, Inc. In the end, there is only one Fostoria American. Nothing else compares, and I say that with conviction. As good as the reproductions and Look-Alikes can be (and there are some of exceptional quality), a Fostoria piece will stand alone. As collectors, it is important to realize the difference between an original piece of Fostoria American and those made by another company in a similar cubist form.